When a commuter rail works well, it really works. Trains transport riders quickly and reliably, eliminating the headaches of driving in traffic and reducing pollution and congestion. The SEPTA Regional Rail has been working better for more people than it has in years, according to data from the rail agency's internal reports. Yet many riders say they just aren't seeing it. "I know that they've been trying to make improvements," said Meredith Montalto, 37. "It just feels like I'm not feeling that or experiencing it much." On Halloween, Montalto left work in Center City to get home as early as possible with her 2-year-old son, who was excited to don his Bob the Builder costume and go trick-or-treating. But the arrival time for her 2:15 p.m. train on the Paoli/Thorndale Line continued to get later and later. The train finally came at 2:40. The Paoli line, a weak performer, was late 14 percent of the time during rush hour in September, and was late even more often during less-busy times, according to data analyzed by The Inquirer and Daily News. "I took vacation time to leave early and get home," said Montalto, who made it home to Downingtown in time for trick-or-treating. "And of course it was a day that the train was late." Over the course of a five-day series this week, The Inquirer and Daily News has chronicled how Regional Rail's 13 lines have shown overall improvement in the last year — in on-time rates, scheduling, train conflicts, and staffing — after on-time troubles in 2015 and 2016. But the line that matters most to riders is the one that gets them to and from home. In August and September, Regional Rail operated with a 90 percent on-time rates for two consecutive months for the first time since the beginning of 2015. But although precise figures weren't available, new preliminary numbers show that streak ended in October. People struck by trains, equipment failures for both Amtrak and SEPTA, and the aftermath of Sunday's heavy rainstorm that took down branches and rail-bedeviling wet leaves, all played a role in hobbling service. 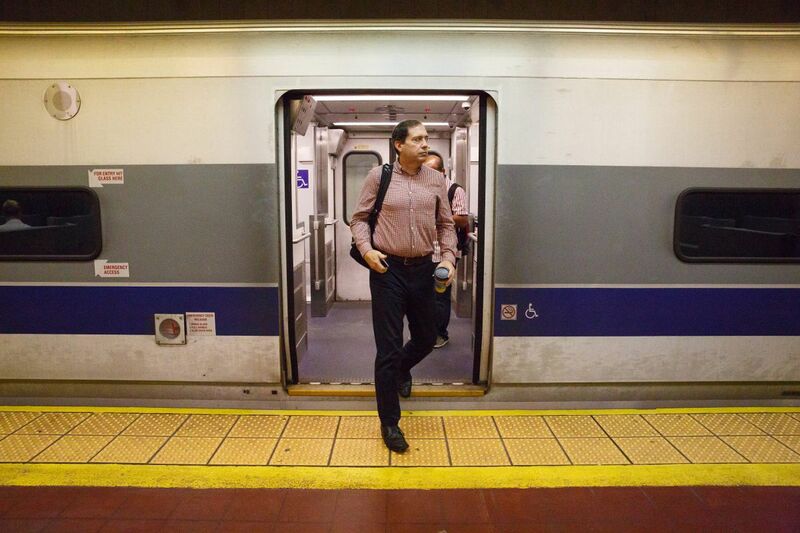 "It's just so complicated," said Jeff Knueppel, SEPTA's general manager, on Thursday. "You can work on problem A and then problem B comes up." He acknowledged that fine-tuning and some more big changes remain before every rider notices improvement. Building on recent gains, SEPTA is looking to expand its rail fleet significantly and is breaking in a new boarding system. He also said that after reading The Inquirer and Daily News' stories and readers' comments this week, he planned to talk to his workers about communicating better with passengers. Among their complaints was what they viewed as a bewildering boarding policy during rush hour that required them to show their passes or tickets before going to the train platform – and then show them again on the train. People surveyed by The Inquirer and Daily News called it "tremendously inconvenient," "mind boggling," and "a waste of time and money." The policy began as a way to deal with the overcrowding caused by the Silverliner crisis in the summer of 2016, when one-third of SEPTA's rail fleet was knocked out of commission by a structural flaw. SEPTA introduced Key to subway, bus, and trolley users this spring and plans to start an early adopter program for Regional Rail users this winter, Knueppel said. A full roll-out for all rail riders is planned for 2018. How well that system will work on the railroad remains an open-ended question for now. "Any time you have change, it can affect how the operation runs," Knueppel said. "You're going to have to have people tapping to mark the start of their trip, and we'll have to see how that works out." SEPTA began installing kiosks for its new smart fare card in late October. Another long-term upgrade is in the works, too: For the first time in decades, SEPTA is expanding its fleet of rail cars. By 2019, the railcar builder CRRC MA should begin delivering 45 multi-level cars that will likely be used on SEPTA's longer routes and express runs, Knueppel said. Those additional cars will take the strain off 1970's-era cars. They will also allow SEPTA to adjust its service, though whether it will lead to more frequent trains would depend on rider demand and staffing numbers, Knueppel said. SEPTA deserves credit for the improvements made in the past year, though, said Barry Seymour, president of the Delaware Valley Regional Planning Commission. A 90-percent on-time rate is a good target, he said, and he said SEPTA was making the progress improving reliability and customer service. Some riders feel the same way. Matthew White said his ride on the Paoli/Thorndale Line is "better," and no matter what, rail travel is far preferable to driving from Malvern to Center City every day. "When you're driving, that time is lost," he said. "And even if it's a nap or just looking out the window, it's relaxation, it's personal productivity, it's work productivity." For all the promises SEPTA has made good on over the last year, plenty of problems and rider gripes linger. In the last year, Knueppel said, SEPTA has focused on big-picture issues such as rebounding from the malfunction of 120 rail cars last summer, installing a critical speed control system, and managing a 50-percent ridership increase since 2000 that has taxed the railroad's capacity. "In our situation, we had lost the macro level," he said. "That took an enormous amount of energy and teamwork to pull that back together." Now, he says SEPTA can begin to focus more on the micro level– things that one rider on one line would notice. Debbie Sandler, 58, is one rider who said she'd noticed some improvement but not enough. Trains she takes on the West Trenton line are less likely to show up half an hour late, she said, but are still often five to 10 minutes behind. "Invariably, there's a delay along the way," said Sandler of her trips on the West Trenton Line between Suburban Station and Somerton Station, near her home in Huntingdon Valley. "Very rarely do I get on the train on time and get to my destination also on time." She said she has been riding SEPTA for more than 30 years. "It's definitely gotten better since then," she said of commuting in the 1980s. "I just know that it could be so much better."